My newest favorite desert is Creme Brulee in Mini Pumpkins. My husband and I love creme brulee but making it in mini pumpkins felt like it was a much healthier option. Its more to convince the mind then to the waist…just kidding. Made it twice in the last 2 weeks. I know it’s not a Goan dessert but it is perfect for Thanksgiving and so I wanted to share this recipe. I adapted the recipe from Group Recipes of their version of Creme Brulee in Mini Pumpkins according to my taste by only adding vanilla extract to the creme brulee. The ingredients are few and its simple to make just a bit of patience on baking. Can be done the day before, in fact I thought it tasted better as the baked pumpkin was sweeter compared to the one I ate on the same day. Also another observation was that baking it in a water bath made a difference in keeping the pumpkin moist and better looking then when I baked it without. 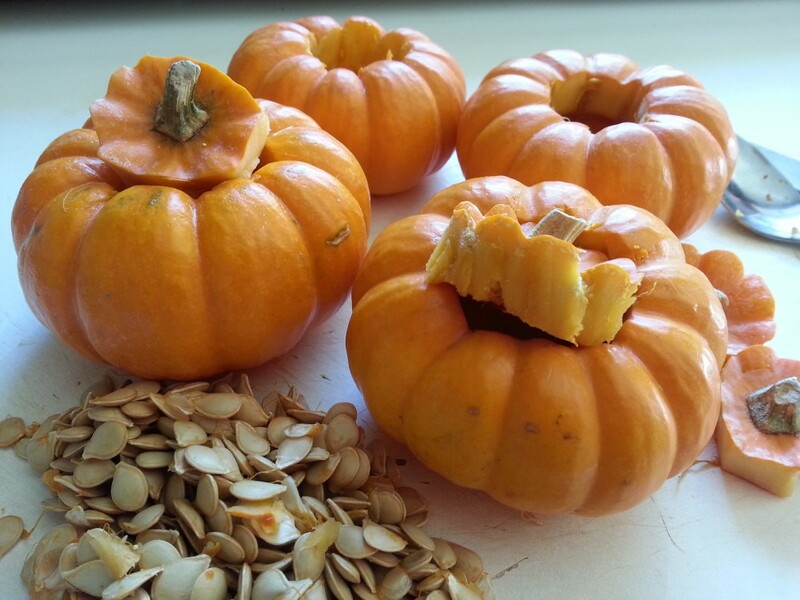 Preheat oven to 360 degree F. Cut open the pumpkins with a pairing knife and clean it out with a teaspoon. In a sauce pan add the whipping cream and bring it to a simmer. Take off heat and keep aside. In a mixing bowl add the whole egg, 2 yolks, sugar, salt, vanilla and lightly whisk the ingredients together. Add the whipping cream slowly will whisking it so it does not cuddle the eggs. Place the pumpkins in a pan, pour in the custard mixture and then add hot water to the pan till midway of the sides of pumpkin. Bake for 40 – 50 minutes depending on the oven or till the custard is done. Insert a toothpick to check and it should come out clean. Chill for at least 2 hour or more. Serve with some sprinkled cinnamon powder if you like. 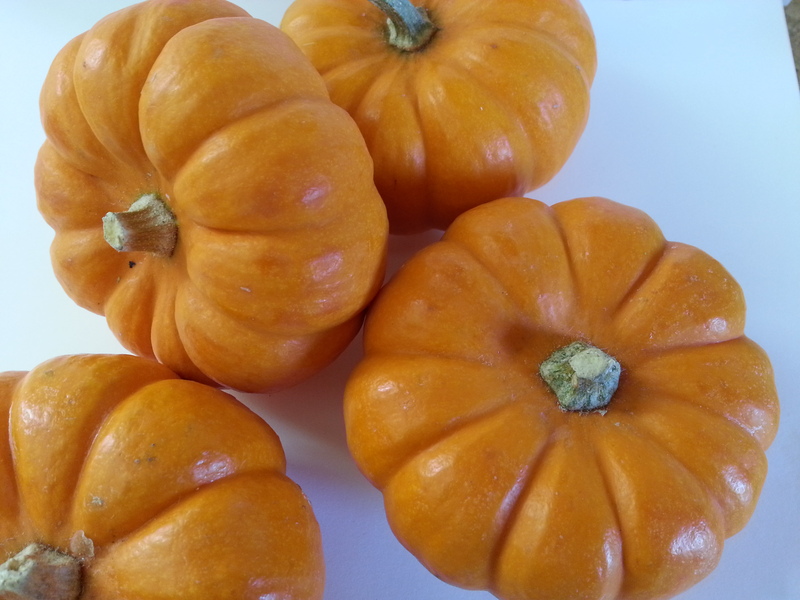 This recipe of Creme Brulee in Mini Pumpkins is great if you are trying to control your portion size and perfect size for kids. wow – this is such great, detailed and organised post.. Thank You so much Mihrank 🙂 Happy New Years! Thank You so much for the re-blog 🙂 Happy New Years! Thanks for the reblog Joel. These are so fun! Perfect for fall, and my boyfriend loves creme brûlée. This is so nice, can i share this ? You sure can. Thanks Much! This is such a cute idea! I will have to remember this in October. It sure is 🙂 Thanks Much ! This is such a great idea! Perfect for autumn holidays. I can’t wait to try it this year. Thank you Eliza, I hope you do :-). Btw thanks for your post on watermelon radish, I did’nt know they ever existed. I used to love going to the farmers, have’nt done it in a long time. Creme brulee is one of my favorites and this looks so elegant and creative! It’s my favorite too Sidney :-). Thank you for visiting. I can’t find mini-pumpkins now but I really want to try this recipe. Any suggestions for something else I could try in place of those? Hi Elizabeth, I’m not sure as to what would be a good replacement as I have’nt tried it with anything else. The only other possibility would be squash. But you would have to find the small ones. I will try making some with squash sometime later. Regards.